In ‘No Landing Place’ Edward Doylerush (1985) says that on the night of 12/13 April 1941 the crew of Heinkel He-111 F4801 had spotted the aircraft carrier HMS Victorious at the docks at Barrow while on a reconnaissance flight. So on the following night, 13/14 April 1941 the bomber took off again from its base at Nantes, the crew tasked with bombing the ship. The attack failed in that the aircraft carrier was not where the crew had seen it and under some intense flak, they released the bombs on the dock anyway and made for home, only noticing after the bombs had gone that HMS Victorious had been moved to another part of the docks. The Heinkel was badly shot up by anti-aircraft fire at Barrow which had damaged the compass and the radio and one engine. Pilot Leutnant Lothar Horras headed for home avoiding the defences around Liverpool, taking a route over the Irish Sea. However in April 1941 the new aircraft carrier HMS Victorious was, according to naval-history.net, undergoing sea trials and passage to Rosyth and so it is highly unlikely the ship was at Barrow at that time; Victorious joined the Home Fleet on April 15th and was involved in the chase for and sinking of the German battleship Bismarck the following month. However, HMS Victorious had previously been attacked by the Luftwaffe in January 1941. Moreover, Nigel Parker (2015) gives a completely different account. 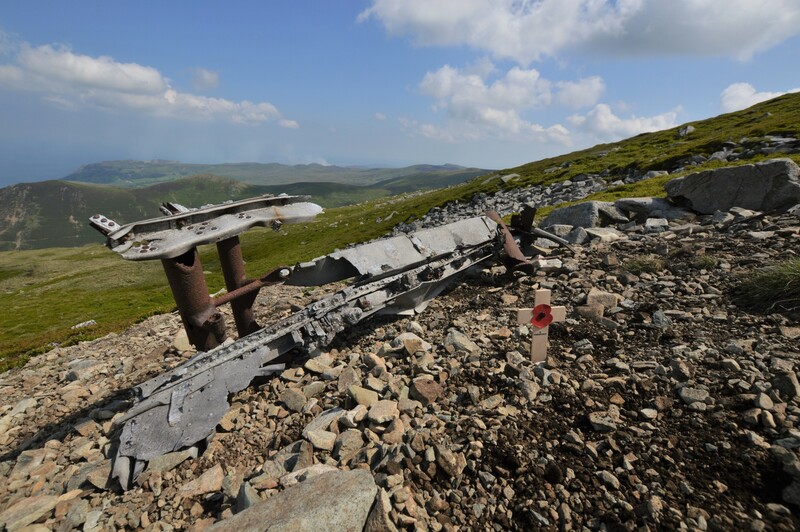 He says that on the 14 April 1941, the bomber was on a shipping reconnaissance mission over Barrow and Liverpool and had flown across the Irish Sea with the intention of turning east for Liverpool but the crew lost their bearings. 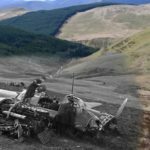 Whichever account is correct, at 0300 the aircraft struck the plateau at Llwytmor Bach in the mountains 5km south of Llanfairfechan in north Wales. The aircraft appears to have careered over the ground before coming to a halt on Llwytmor and burning out. The initial impact killed engineer Gefreiter Josef Brüninghausen who had been in the dorsal turret, his decapitated body found lying on the plateau. The remainder of the crew survived, and the least injured of them all, Gefreiter Kurt Schlender made his way across the plateau and down the valley of Afon Anafon where he sought help from the farm at Cydgoed on the road down to Aber. The crew were taken prisoner, and transferred eventually to Canada. Doylerush refers to the crew spending some time at “Carlton Mill” at Oldham, though I imagine that should be Glen Mill, which was a very large PoW camp at Oldham and had many German prisoners pass through its gates. 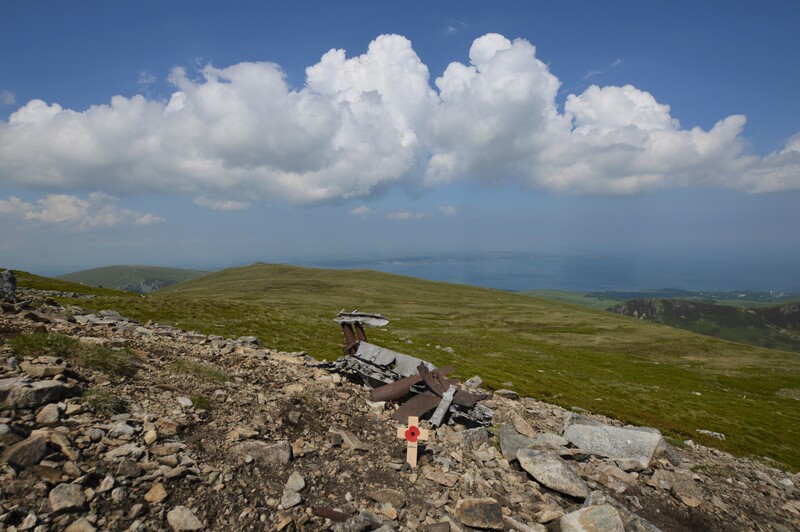 Lead photo above shows the crash site looking down towards the plateau of Llwytmor Bach where the Heinkel first struck and where the body of Gefreiter Brüninghausen was found by Gefreiter Schlender. The route he took to get help the next morning was across the plateau and down the valley to the right. Below; two more views of the crash site. This is the most debris I have seen at a German crash site. 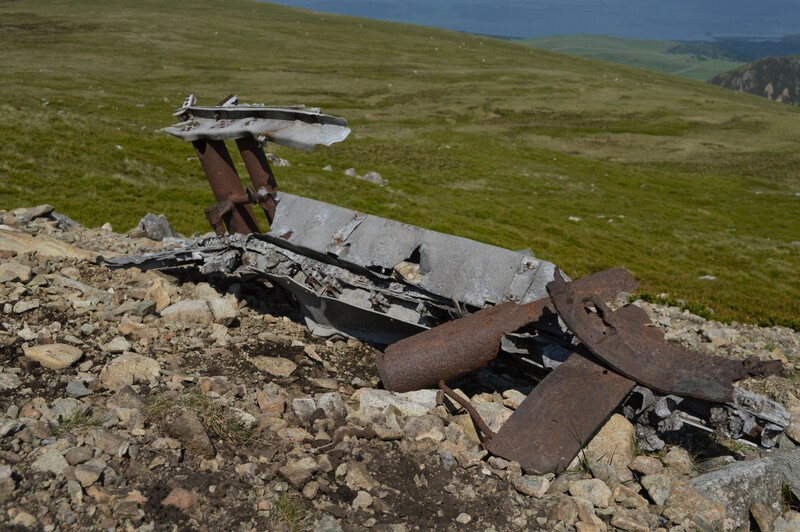 I’m researching into a programme on Abergwyngregyn and will be featuring a small item on this crash. Are you able to tell me if these photos are available to be used? Would the permission come from yourself? Thank you for asking, yes the photos are mine. 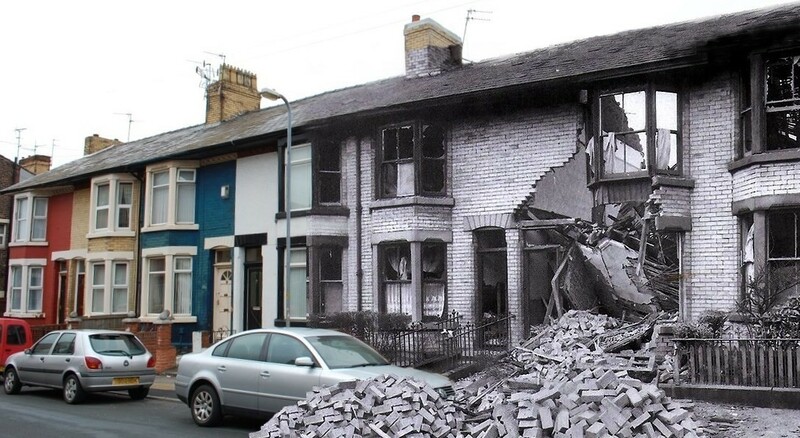 You are welcome to use the photos as you see fit, credit to aircrashsites.co.uk please. Many thanks Ian and no problem with the credit.